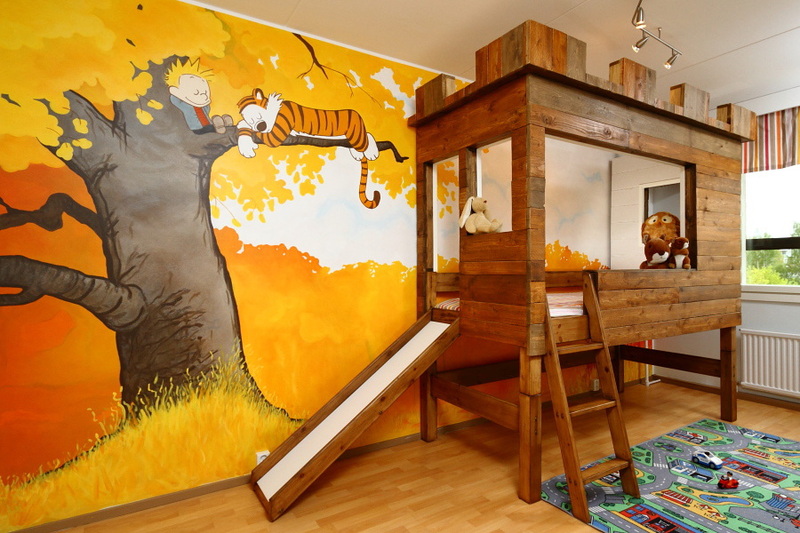 This is a Calvin and Hobbes themed kid's room. I honestly can't think of another place I'd rather take an afternoon nap right now. It just looks so peaceful. At least until I climb out of that bed and step on one of the toy cars on the floor, then it's gonna be a lot less peaceful and a lot more profanity and probably getting grounded and my Nintendo privileges taken away. But mooooom! "No buts." Yes huh butts! TONS OF FAT ASSES. And they're all booty-popping in sync to the sound of me playing Excitebike. Thanks to Ferrous, who wants to sleep in space. Ambitious! I'd be happy sleeping on a bench at the bus station. To be honest i would still sleep in that room kick the kid out its mine. Who else is suddenly extremely disappointed by their 80's parents? All I had was ghetto airplane wallpaper. Weak. Read More: bedroom, bunkbed, calvin and hobbes, dammit now i want a bed with a quick-escape slide, good job, good lookin, growing up right, interior design, it's like having a treefort inside!, lucky kids, mural, painting, peaceful, relaxing, so jealous right now, sure why not, where was mine growing up? !